We do not collect any personal identifying information from you for merely using our website. We collect information from you such as your email address and a user name when you subscribe to our newsletter or fill out a form. We may occasionally email you with announcements, notices of blog posts or other relative information. You may unsubscribe to our newsletter at any time by following the instructions at the bottom of one of the emails. We use third-party advertising companies to serve ads and collect information when you visit our website. These companies will not have access to any personal identifiable information including your name, address, email address or phone number. We will never share your email address or other private information with anyone without your permission. Any of the information we collect from you may be used in one of the following ways: To personalize your experience (your information helps us to better respond to your individual needs). To improve our website (we continually strive to improve our website offerings based on the information and feedback we receive from you). Data security is very important and we implement a variety of security measures to maintain the safety of your personal information when you enter, submit, or access your personal information. CERTAIN CONTENT THAT APPEARS COMES FROM AMAZON SERVICES LLC. THIS CONTENT IS PROVIDED AS IS AND IS SUBJECT TO CHANGE OR REMOVAL AT ANY TIME. www.UPickFarmLocator.com is a participant in the Amazon Services LLC Associates Program, an affiliate advertising program designed to provide a means for sites to earn advertising fees by advertising and linking to amazon.com. This website is directed to adults, it is not directed to children under the age of 13. We operate our site in compliance with the Children’s Online Privacy Protection Act, and will not knowingly collect or use personal information from anyone under 13 years of age. 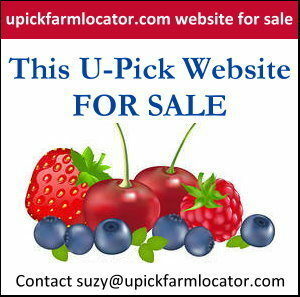 The website, UPickFarmLocator.com, is designed to help the user find local farms. The information posted on our website is accurate to the best of our knowledge. We are continuously updating the farm listings as we learn of changes or corrections. We have no responsibility or liability to the user’s actual visit and interaction with the individual farm. Users may amend or remove any personal information they have provided U-Pick Farm Locator by contacting us and describing the information they want removed. Email subscribers can remove all personal information they have provided by emailing their desire to unsubscribe at the link provided in the email they receive.